The attention of travelers is drawn to the fact that their presence is required at the airport two hours before the scheduled departure time. Most companies close their check-in counters 45 minutes before departure time. Once you have checked in, it is also advisable to go immediately to the boarding gates, as police formalities may take a long time if several take-offs are scheduled at short intervals. 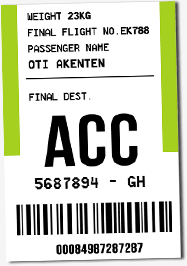 Entering the Ghanaian territory by Accra-Kotoka International Airport requires for travelers other than Ghanaian citizens a passport valid more than 3 months after passing the police station. In addition, nationals of certain countries must obtain a visa in the nearest consular representation. WARNING: bi-national passengers who can not prove their Ghanaian nationality (passport or ID card) are considered as foreigners. Your pet must be accompanied by a health certificate or vaccination card issued by a veterinarian from the country of origin, provenance or possibly transit. This certificate must indicate in particular the identification number and, where applicable, the description of the animal. GOOD TO KNOW: Some animals are subject to regulations for the protection of endangered species. This is the Washington Convention better known as the "CITES Convention". Travelers bringing with them the species covered by the agreement must submit a CITES import permit to the Customs. The yellow fever vaccine (made at least 10 days before your departure) is mandatory and the international vaccination certificate must be presented upon arrival. Babies younger than 9 months are exempt from this obligation. In addition, passengers with a disability requiring assistance or special adaptation in flight must inform the airline to be picked up upon arrival at the airport. Some products can not cross borders on arrival or departure. This is the case for weapons, munitions, narcotic drugs and psychotropic products, writings and videos and any object contrary to good morals and public order. Hazardous products (firearms, explosives, corrosive products, pressure vessels, etc.) are generally prohibited or regulated. Please contact your airline to find out its policy on the transportation of these products. In addition, a strict control of narcotics is carried out by the police officers of the airport. The canine brigade allows regular cocaine seizure. Searches can be performed randomly on passengers.